Last week the winners of the 2nd Canadian National Book Collecting Contest were announced, and I was fortunate enough to be able to gather a Q&A from each young collector! Justin Hanisch is a 27-year-old collector from Edmonton, Alberta currently pursuing a PhD in Ecology at the University of Alberta. 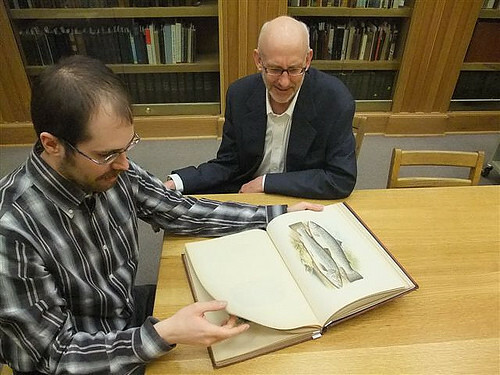 His collection on The History of Fish placed 1st in this year’s contest, and though I have had the privilege of reading his entry, it has not yet been published by the Bibliographical Society of Canada so you will have to wait a little longer to see exactly how impressive this collection is! Take my word for it – it’s very impressive. Justin & Deacon Foundation president John Meier. When and how did you realize you were more than just a book-buyer or reader, that you were a book collector? Can you elaborate on your discovery of book collecting as a discipline? I was a reader from a young age, but I can remember the first book I bought for both its text and its appeal as an object. I was probably 12 or 13 and found a beat-up, soft cover copy of Jed Davis’s Spinner Fishing for Salmon, Steelhead, and Troutat a library book sale. I no longer collect fishing books, but this book still has a special place in my heart. I bought it because I like fishing, but I also bought the book because the objectappeared to have lead an interesting life. At that moment, I think I became a book collector— someone who buys books for both the text and the object. I like to think I’ve refined my collecting since then, but I’m still very interested in the provenance and individual histories of the books in my collection. For the past 5 or so years, I’ve started to read books about books fairly heavily. I really like bookseller memoirs and book collector biographies, like A.S.W. Rosenbach’s Books and Biddersand Donald C. Dickinson’s Henry E. Huntington’s Library of Libraries. Reading books like these has really helped me to learn about and appreciate the history of the book trade and book collecting as a discipline. Do you have a preferred method of acquiring books for your collection? In theory, book fairs and book stores are my preferred method of acquiring books, but in practice, I have to rely on the internet. Most general shops and regional book fairs don’t have a large stock of old fish books, so I have a variety of regular eBay searches. I also have a few dealers whose websites I frequent and whose catalogues I receive. How do you think internet resources (like eBay, Abebooks.com and online auction houses) have affected book collecting? I think the internet has benefited collectors tremendously. It has revealed that a lot of books thought to be scarce are really quite common, which benefits me as a collector through lower prices. The internet has also resulted in a huge flood of books, which previously would have been offered through expert book dealers, being offered by novice dealers. This results in a lot of bad material being poorly described but also results in a lot of good material being poorly described. With thorough research and careful questions, some excellent books can be purchased for very little money. The internet also makes research materials easily available. The University of Alberta has online access to American Book Prices Current, which I reference frequently. I also make use of digitized books, often through the Biodiversity Heritage Library, to compare books I’m interested in purchasing with other examples. Interlibrary loan is also a great way to request bibliographies and other materials through the internet. I do hate wading through legions of print-on-demand books that flood searches, though. Did your decision to study ecology (and fish) follow your collection, or pre-date it? About the time I decided to study fish at university, I decided to refocus my collection from books on fish and fishing to books exclusively on fish. I’ve since sold a lot of my fishing books and put the money toward books specifically about fish. However, I have retained in my collection some specially chosen fishing books that reveal something interesting about fish. For example, I have a fishing book in my collection from 1884 that lists many places in Michigan (my home state) to catch Michigan grayling. The Michigan grayling is now extinct through anthropogenic actions, so the book remains testament to a beautiful species that was wantonly destroyed. Do you have any other subjects that you “collect”? Although almost all my collecting budget goes into my fish books, I do have small collections of books about books and first editions of Canadian literature. If money were no barrier, I would rapidly expand both those collections, and I’d love to assemble a library of every book Darwin referenced in his On the Origin of Species. If you could add any single book to your collection, regardless of cost or availability, what would it be? How did you hear about the National Book Collecting Contest, and how did you initially feel about your odds of placing? I’m a member of the Alcuin Society, and at the time of the first National Book Collecting Contest, members of the Alcuin Society were ineligible to apply. I saw the second contest advertised in Amphora, and the statement disqualifying Alcuin members was absent. So, I decided to apply. In fact, I was quite excited by the contest and had finished and submitted my entry a couple months before the deadline! I was cautiously hopeful that I would place in the contest. Books and fish are my primary passions, and as such, I have spent a lot of my time reading about books in general and fish books in particular. I felt I was knowledgeable about books and had assembled a decent collection, so if I could craft a good essay, I hoped that I would place. Needless to say, I was delighted to win! Any opinions on how to encourage other young people to take up collecting? I’m not sure it’s fruitful to encourage someone to collect who isn’t already predisposed to it. Of all the people who’ve I’ve talked to about my collection, not a single one has said, “Boy, that sounds like fun, I think I’ll collect books!” That being said, I do see an encouraging number of young people at book fairs and book stores. These young people are the ones likely most amenable to learning more about book collecting as a discipline. I think a “Young Collector’s Booth” could be set up at book fairs to hand out free electronic copies of books on books that are in the public domain (like A. Edward Newton’s Amenities of Book Collecting). The same booth could have a contest to win current books on collecting, like ABC for Book Collectorsor books by Nicholas Basbanes. There is also a large infrastructure of University-level book collecting contests in the States. I think Canadian universities could sponsor similar contests. It should also be stressed to potential collectors that you don’t need a lot of money to collect books. There are countless under-collected or non-collected fields in which a new young collector could quickly become an authority. Such collections may also serve as important sources for future historians. But, I will echo the advice I often hear: collect something you are passionate about. A successful collection requires a good deal of research, which can be exciting and rewarding in a topic of interest, but tedious without a driving passion. If your passion falls into an under (or non) collected area, then you’ve potentially hit the jackpot! Read my interview with 2nd place winner Gregory Robert Freeman here, and 3rd place winner Kieran Fox here! Links to their prize-winning essays to be added as soon as I can! In even better news, the 3rd National Book Collecting Contest has already been announced! This is heartening news as there was a year “break” between the 1st and 2nd contests in which the continued value of the contest was clearly being evaluated. This immediate announcement, coupled with the news that new sponsoring partners have been added, including ABE Books, CBC Books and the National Post, surely means good things about the long-term prospects of the prize. Well, first of all let me apologize for the prolonged suspense! This summer holiday went into several rounds of overtime, and I have been caught up in the very busy business of reading in the backyard, meeting with old friends for tea and teaching the little one which rocks, twigs and leaves at the park are best for eating (answer: any). But all good things have to come to an end, and new good things have to be taken up again. May’s virtual exhibit, Like Minds: The Triumphs and Trials of Collaboration has been an eye opener. First of all, submissions were overwhelmingly genre books, science fiction and fantasy. Being a fan of both genres I can’t say that I mind, though as I wasn’t able myself to come up with many non-genre examples and had hoped you lot out there would be able to jog my memory. Not a lot of luck there, but it does stand out as a sort of mystery to me. Why are genre writers so willing to share a byline, while examples in “literary” fiction are impossible to come by? I don’t have an answer today. Just a quick PSA to let you know that I’m not dead, but that I won’t be making any posts this week before Friday’s Digital Book Collection. Real life… you know how it is. So in the meantime, go out with your phones and your cameras and hunt books! The deadline for this month’s contest is Thursday night – lots of time to inundate my inbox with entries. Welcome back, or perhaps just welcome if you’re new to this. It is the last Friday of the month, and that means community building time here at Inklings! One per month Inklings hosts a virtual book collecting contest. The object will be to build, virtually, a collection on a theme of my choosing. Our collective task will be to bring together images of books that we think belong in the collection. In order to submit a book to the collection you need only take a picture of it. You don’t have to own it but you do have to be able to take a picture of it – no Googled images allowed! Go out and look around; check bookstores, libraries, garage sales, museums, friends’ houses – anywhere! If you see a book that belongs in the collection, snap a photo of it and send it in to charlotte@once-and-future.com along with a short description of the book (title, author, publication date; that kind of thing) as well as a note on where you found the book and why you think it belongs in the collection. No limit to the number of entries, either – go wild! Next Friday I will compile all the submissions and present a virtual exhibition of our collection. The person who submits the “best” contribution will get a prize – this month I have a lovely upcycled lined journal from Cover Stories on the offer. Please have your entries to me by bedtime on Thursday, June 4th 2009. Where? On my husband’s bookshelf. Why? This is an utterly uncollectible edition, but the work itself is one of the best collaborations in speculative fiction. One of the cases where two heads really are better than one! Why? Old Possum’s was always a cute book, but the addition of qurky Gorey illustrations made this a hit outside the usual poetry crowd. Why? This is my meta entry: Glyer uses the Oxford literary group known as the Inklings as a case study in writers who have worked in community. Know your subject! Note I have extended the deadline this month – you have a week to enter rather than the usual three days. Good hunting! As I type this it is Monday: with any luck this will be posted before Tuesday though if I don’t manage to get it up in time let me extend my apologies for the delay and my thanks for your patience! This month’s virtual exhibit, Travel: The Poetry of Motion, has been a good deal of fun to put together because though the subject is quite general, some interesting themes emerged as the literature presented itself. The history of travel literature is distinctly Western and often colonial, and the present is apologetic, reflective and surprisingly inward-looking – what will be the future, I wonder? When we’ve mapped all the places and normalized or done away with the concept of “foreign-ness”, what will remain? What will travelers of the future write home about? Well here we are again, on the last Friday of the month. And as promised, I have another virtual scavenger hunt on the offer! One per month Inklings will host a virtual book collecting contest. The object will be to build, virtually, a collection on a theme of my choosing. Our collective task will be to bring together images of books that we think belong in the collection. In order to submit a book to the collection you need only take a picture of it. You don’t have to own it but you do have to be able to take a picture of it – no Googled images allowed! Go out and look around; check bookstores, libraries, garage sales, museums, friends’ houses – anywhere! If you see a book that belongs in the collection, snap a photo of it and send it in to charlotte@once-and-future.com along with a short description of the book (title, author, publication date; that kind of thing) as well as a note on where you found the book and why you think it belongs in the collection. On Monday I will compile all the submissions and present a virtual exhibition of our collection. The person who submits the “best” addition to the collection will receive a prize – this month, the prize is a book bag and bookmark from the Osborne Collection of Early Children’s Books. Please have your entries in to me by 6am on Monday, April 27th – in time for me to make my post on Monday! Found? At Contact Edition in Toronto, Ontario – though now it lives in my library. Why? 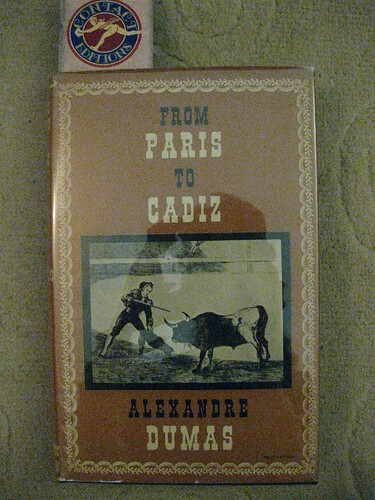 This is the first English translation of Alexandre Dumas’ voyages to Spain, considered the “high water mark” of his “Impressions de Voyages”. Dumas’ travel books are colourful, exciting and almost entirely non-fiction. Found? In my dining room. Why? The perfect atlas to all the places that never existed. 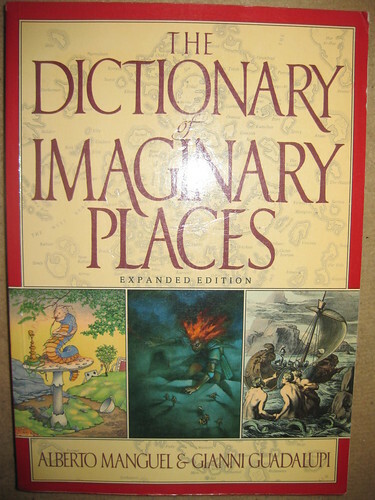 The Dictionary includes extensive maps of fictional worlds as diverse as Tolkien’s Middle Earth and the Swiss Family Robinson’s New Switzerland. Plan your flights of imagination with this meticulous resource. So good hunting! I will see you on Monday!